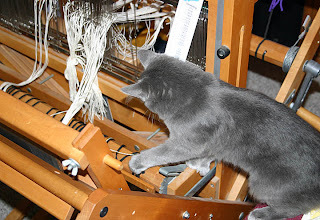 I'd just started putting a new warp on the loom, which is why I grabbed the camera instead of the cat. 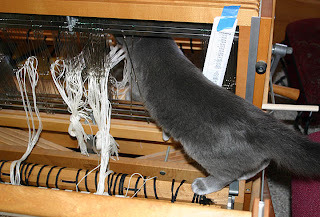 Lily decided it would be fun to help me out. 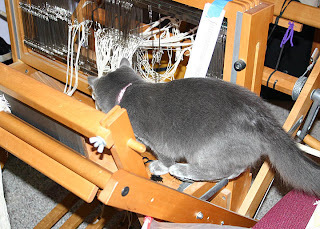 But I'd rather know how curious she is about the loom now, rather than wake up one morning and find a completed warp damaged. She might not live through that one. As an outsider I'd have to say how adorable! 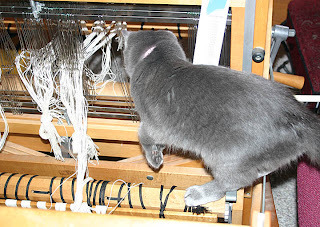 But as a fellow weaver my response to your picture would be AAAHHHH!! !